I've loved to run ever since I was a young boy. Besides a one-mile daily run, once a week I go for a refreshing one-hour trek in the beautiful hills of a forested park not far from my home. I clearly remember back in elementary school reading world-famous runner Glenn Cunningham's incredible story of determination and how it inspired me to believe that anything is possible. This amazing story of a boy who was supposed to die beautifully shows the incredible power of determination. I deeply believe that we are much more powerful than we might ever imagine. May we find ways to tap into and use this power for the good of all. The little country schoolhouse was heated by an old-fashioned, pot-bellied coal stove. An eight-year-old boy named Glenn Cunningham had the job of coming to school early each day so that he could use kerosene to start the fire and warm the room before his teacher and his classmates arrived. One cold morning someone mistakenly filled the kerosene container he used with gasoline, and disaster struck. The class and teacher arrived to find the schoolhouse engulfed in flames. Terrified on realizing that Glenn was inside, they rushed in and managed to drag the unconscious little boy out of the flaming building more dead than alive. He had major burns over the lower half of his body and was taken to a nearby county hospital. From his bed, the dreadfully burned, semi-conscious little boy faintly heard the doctor talking to his mother. The doctor told his mother that her son would surely die – which was for the best, really – for the terrible fire had devastated the lower half of his body. But the brave boy didn't want to die. Glenn made up his mind that he would survive. And somehow, to the amazement of the physician, he did survive. Yet when the mortal danger was past, he again heard the doctor and his mother speaking quietly. The mother was told that since the fire had destroyed so much flesh in the lower part of his body, it would almost be better if he had died, since he was doomed to be a lifetime cripple with no use at all of his lower limbs. His mother refused to let the doctors amputate. Once more this brave little boy made up his mind. He would not be a cripple. He would walk. But unfortunately from the waist down, Glenn had no motor ability. His thin, scarred legs just dangled there, all but lifeless. Ultimately Glenn was released from the hospital. Every day afterward his mother and father would massage his little legs, but there was no feeling, no control, nothing. Yet his determination that he would walk was as strong as ever. When he wasn't in bed, he was confined to a wheelchair. One sunny day his mother wheeled him out into the yard to get some fresh air. This day, instead of sitting there, he threw himself from the chair. Glenn pulled himself across the grass, dragging his legs behind him. Ultimately through his daily massages, Glenn's iron persistence and his resolute determination, he did develop the ability first to stand up, then to walk haltingly with help, then to walk by himself – and then miraculously – to run. Glenn began to run to school. He ran for the sheer joy of running and being able to run. He ran everywhere that he could. The people in his town would often see him run by on his way to who knows where and smile. Later in college Glenn made the track team where his tremendous determination paid off. He eventually received the nickname the "Kansas Flyer." In February 1934, in New York City's famed Madison Square Garden, this young man who was not expected to survive, who would surely never walk, who could never hope to run – this determined young man, Dr. Glenn Cunningham, ran the mile in four minutes and eight seconds, the world's fastest indoor mile! Later that same year in a prestigious outdoor track meet, he shaved another second off his record to run the world's fastest mile to that time. Note: To verify this amazing true story, see the Glenn Cunningham article on the website of the Kansas Sports Hall of Fame at this link. 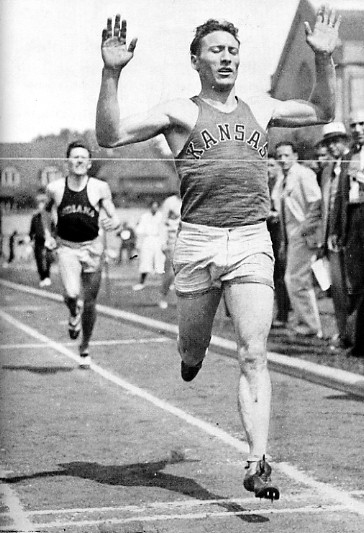 Partially because of his incredible story of determination, Glenn Cunningham was inducted into the National Track and Field Hall of Fame in 1974. And for a powerfully inspiring, short video showing other determined individuals who had to overcome major obstacles to achieve great fame, click here. Share Glenn Cunningham's inspiring story of determination with your friends and bookmark this article on key news websites using the "Share" icon on this page.